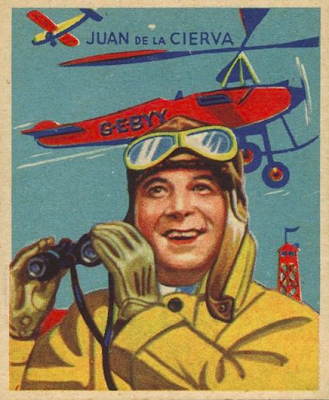 As a young collector I knew "Topps" meant baseball cards with gum and gum with baseball cards; the two came as one, often because they were stuck together. You chomped on the gum and relished its 30 seconds of sugar flavor, about long enough to riffle through the players themselves. 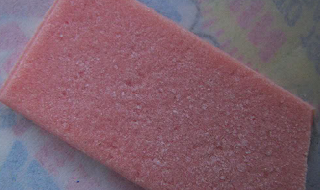 Unfortunately for 21st-century collectors, those chalky pink slabs calcify after a year or two, leaving a bad taste in the mouth of anyone brave enough to try a piece from the 1980s. 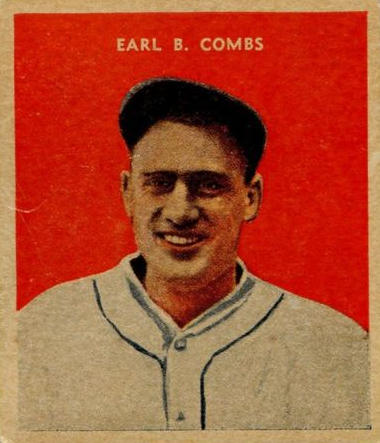 There's no gum on Mr. Combs, partly because Boston-based United States Caramel Company packaged these high-contrast players with slabs of caramel, each package containing one card and one piece of candy. Not every card survived the candy packaging process unscathed. 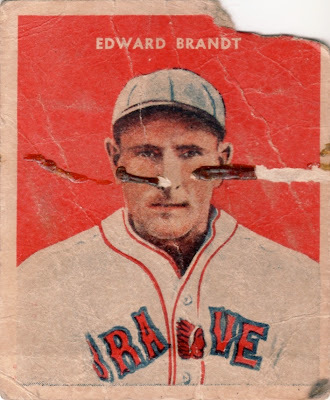 I assume that's a gooey caramel streak across the face of #28 Ed Brandt, perhaps from being stacked under another candy pack. 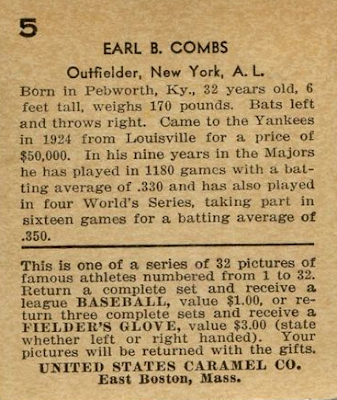 U.S. Caramel produced this scarce set of 32 sportsmen (included 27 baseball players) and offered a baseball or glove in exchange for complete sets. 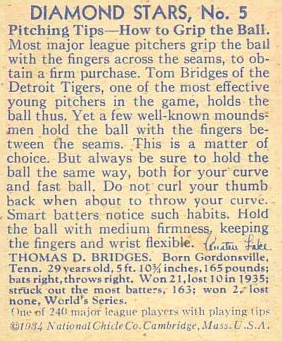 Like other promotions, the "catch"--no pun intended--was #16 Lindstrom, who they severely short-printed. 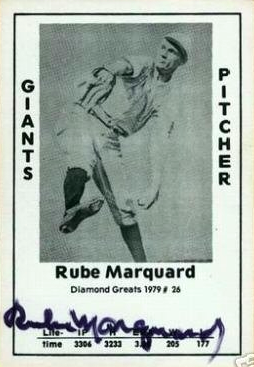 Very few of his cards survive today, a white whale for what's already an expensive hunt. 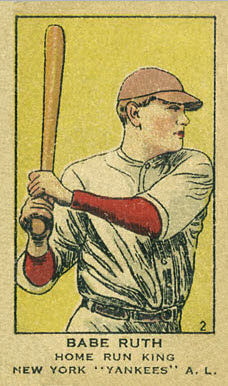 Collectors consider this set complete at 31 cards, leaving a gap at #16. It's the same attitude taken by most in building the 1933 Big League Gum set, which Goudey originally issued without #106 (details in my Closer Look at Goudey for 1933-34). Once sent to the company for a redemption, U.S. Caramel stamped (and sometimes hole-punched) each card to prevent their reuse for another prize. 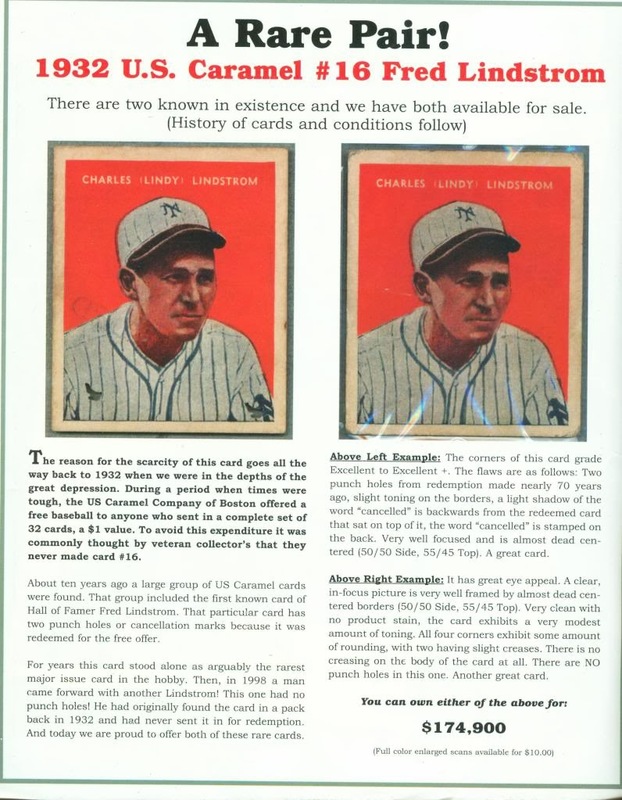 The Net54Baseball.com discussion on canceled Caramel cards includes this detail on two known Lindstroms. Click through for the provenance and pricy details. 1932 or 1933? 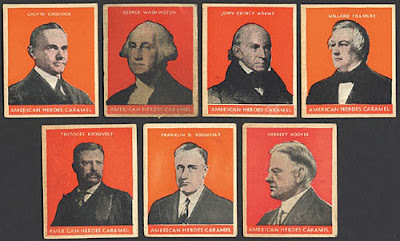 Early catalogs dated U.S. Caramel's Famous Athletes to 1932, thanks in part to their lookalike 31-card run of American Presidents, which capitalized on the 1932 election fervor. Card backs reference events during and after that season, though, so the set's properly dated 1933. See this discussion for more. Based on context, I believe American Presidents debuted during the 1932 campaign (with newly-elected FDR added as #31) and Famous Athletes followed in the spring of 1933, but I doubt they fared well against Goudey's beautiful 1933 Big League Gum cards. U.S. Caramel never attempted another baseball set and might've been sucked up in a 1930s wave of acquisitions by candy conglomerates that knocked most small businesses out of the market. The Famous Athletes set proves so rare that I've been unable to find my own #5 and today's front/back scans come from a (super expensive) eBay listing. If you've got a Combs to trade, let me know! 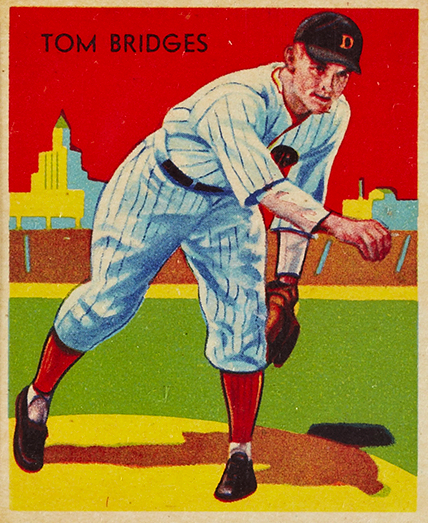 Value: Low-grade cards run at least $30 and will vary considerably, given their short supply. 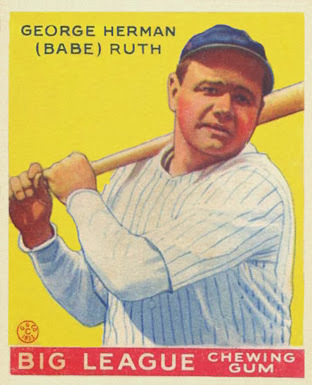 Superstars like Ruth and Gehrig go off the charts, well into the thousands. 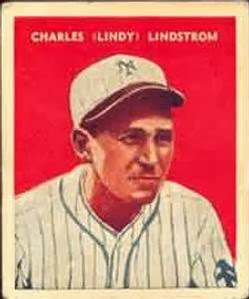 #16 Lindstrom is one of the hobby's rarest and most expensive cards. Fakes / reprints: Unfortunately, plenty of fakes exist for Ruth and probably most of the others. Be very careful when purchasing Caramel cards; expert forums like Net54Baseball.com are one place to seek guidance in rare card shopping. 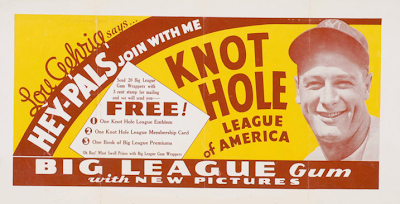 My last post on Goudey Gum tracked the evolution of their baseball customer loyalty program, The Knot Hole League, as one example of how trading cards and strategic guile helped one company survive a Depression that finished off most of its competition. 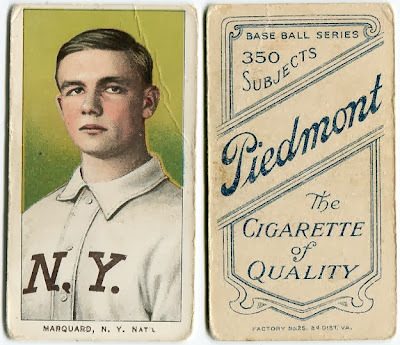 Today's follow-up examines two business strategies common to Goudey's many trading cards: photo reuse (to save money) and playing with numbers (to add revenue). 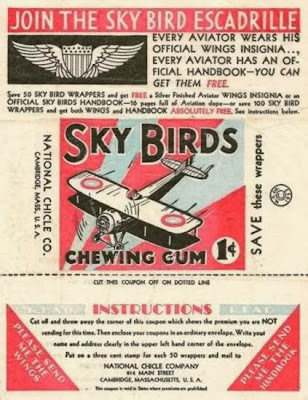 Both figure into their Big League Gum marketing and say a lot about Goudey's perspective on their seminal 1933-34 sets. 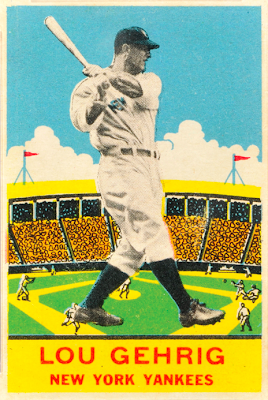 First up, an iconic card of the Iron Horse, Lou Gehrig, from Goudey's baseball debut. Next up, an iconic card of The Iron Horse, Lou Gehrig, from Goudey's baseball debut. 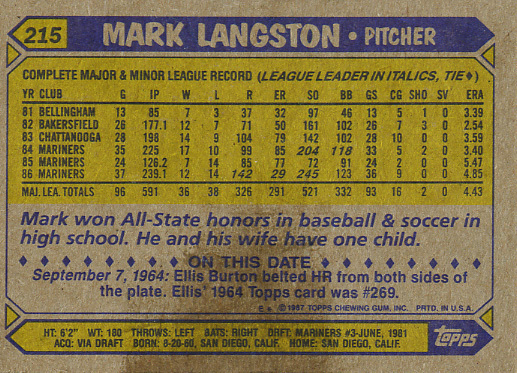 Photo reuse: Yep, that's the same card front repeated just 68 numbers apart. 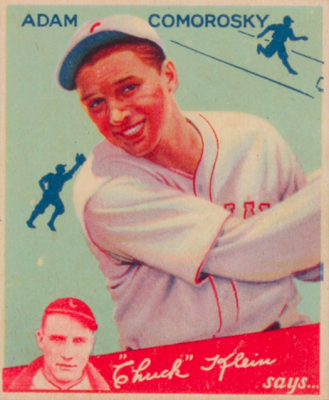 Goudey's Big League Gum averaged 48 new cards (two series of 24) per month during 1933's baseball season, so maybe they thought Gehrig's clone would escape detection, or at least no one would care. After all, they were working on the most ambitious gum set yet attempted and the more Gehrig cards, the better. Who knew how successful it would all ultimately be? 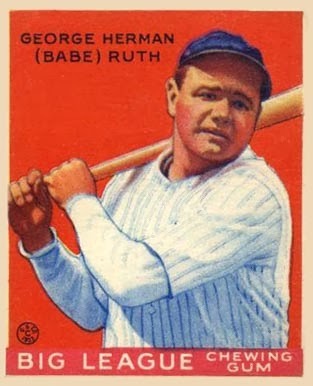 Goudey gave Babe Ruth a similar treatment on two of his cards, as only backgrounds distinguish them. 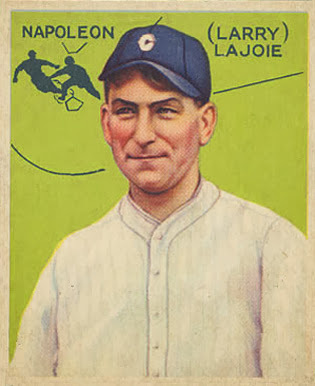 Playing with numbers: Goudey's infamous Nap Lajoie card only exists because customers complained of their (intentional) numbering gap. Kids bought card-after-card in search of the elusive #106, a player that never existed in 1933. 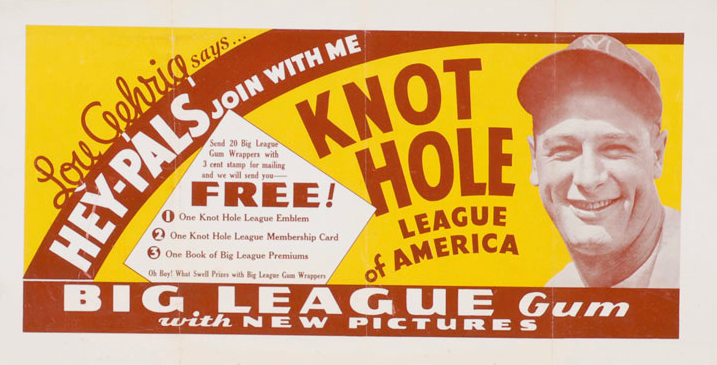 As also seen in my Knot Hole League profile, Goudey finally printed this Lajoie with their fourth series of 1934 Big League Gum and mailed them, a year later, to customers who requested one. Photo reuse: Goudey's successful 1933 foray into baseball made further sets inevitable and they didn't change design tactics. 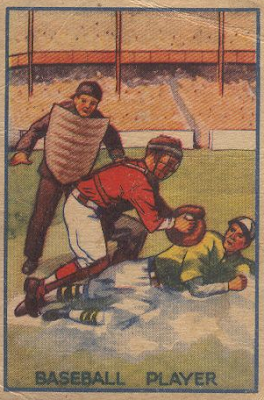 1934 Big League Gum's first series looked an awful lot like 1933. Photo reuse: All 24 players in 1934's first series repeat their 1933 pose over a ballpark silhouette and "Lou Gehrig says..." tagline. 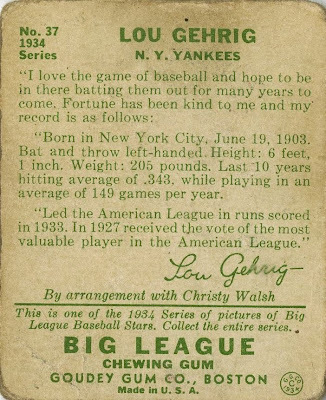 And speaking of diamond backgrounds and Lou Gehrig, note 1934 Big League Gum's similarity to this 1933 set published by DeLong Gum, a one-year competitor founded by their former treasurer, Harold DeLong. 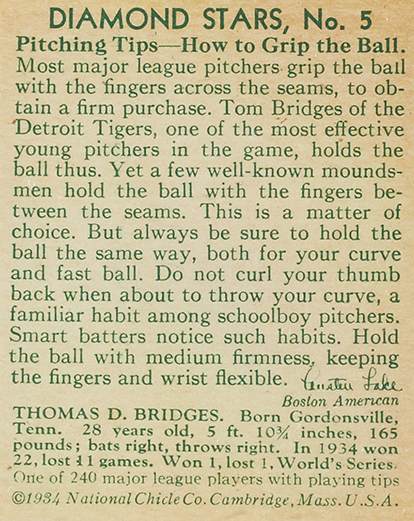 Not sure whether to call Goudey's 1934 version "inspiration" or "rip-off," but it's not a coincidence. 1934's Big League Gum virtual gallery shows how much star power Goudey repurposed for #1-24, including Foxx, Carl Hubbell, and a half-dozen other future Hall of Famers. Only a handful of big names (Lou Gehrig included) appear in the set's other 72 cards. I think Goudey changed this set's purpose after #24, perhaps due to customer complaints about 1934's player repetition and copycat design. More on that below, but first, let's look at a change to their numbering. 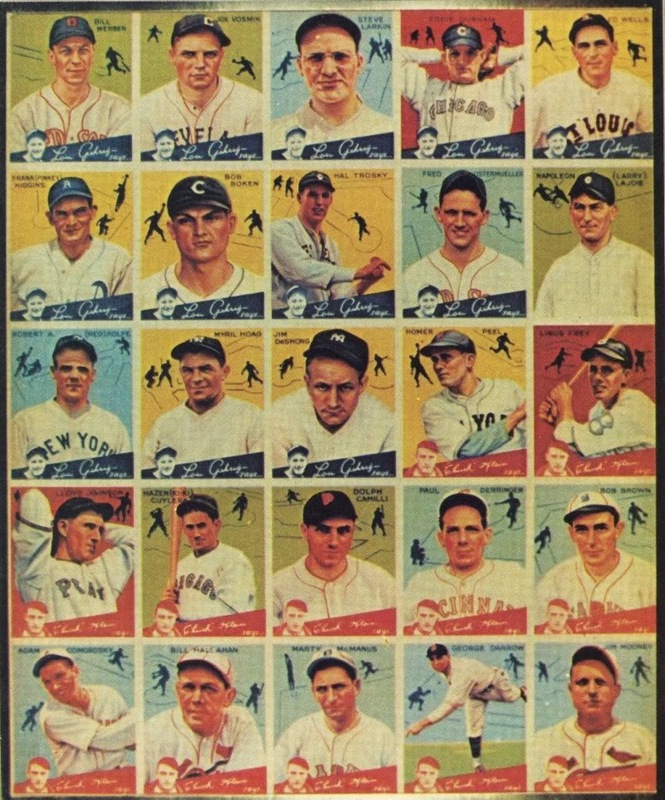 Playing the numbers: Apart from their aforementioned #106, Goudey printed its entire "series of 240 Baseball Stars" in 1933, but they didn't follow the simple process you'd expect. See that "originators of Indian Gum" tagline? 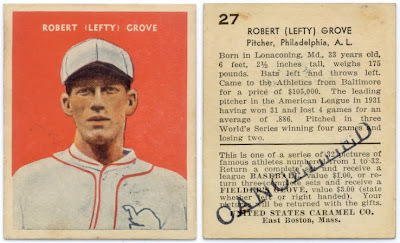 PSA's dive into Goudey's multiyear, multifaceted Indian Gum set details the skip-numbering, staggered series, and changing checklist sizes typical of Goudey's set design. 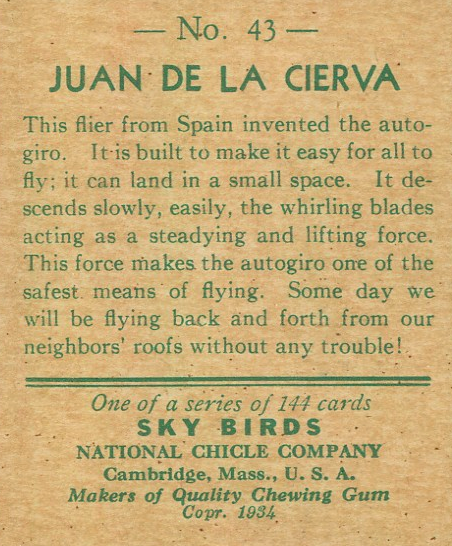 Indian Gum started as one series of 24 hand-tinted portraits, but ballooned into a 300+ card effort kids could still find at candy counters in the early 40s. 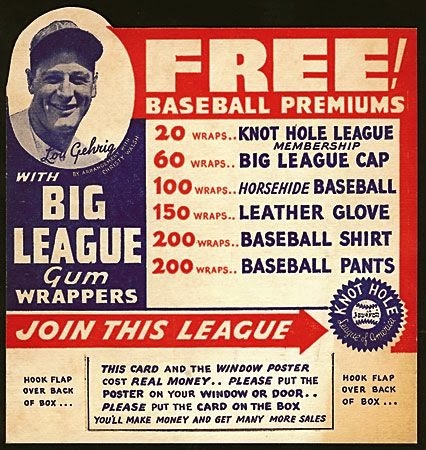 We can assume a similar approach to their Big League Gum sets. 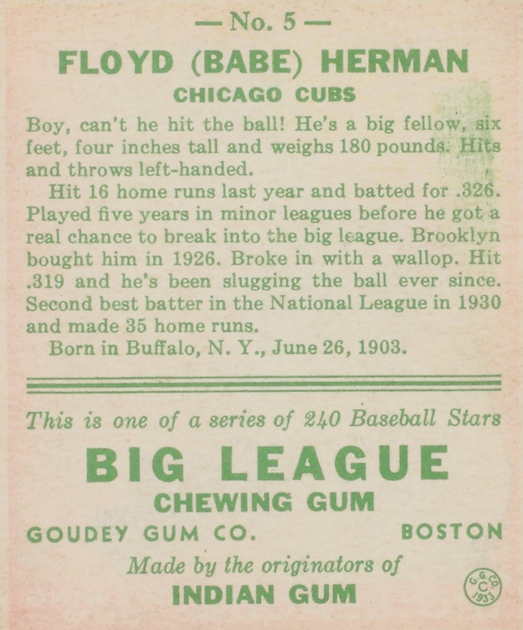 As seen above, 1934 Big League Gum dropped its set count from card backs ("Series of pictures of Big League Baseball Stars," with no number) because Goudey was still selling 1933 packs alongside 1934's new series and would continue to for as long as the gum kept moving. Once gum companies found a trading card "hit" with customers, they squeezed that stone for blood by omitting or overstating the number of available cards, obscuring just how many made for a complete set. If a set continued to sell, great! Otherwise, collect your money and move to the next project. 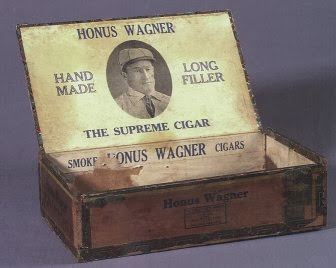 "By arrangement with Christy Walsh"
Based on a closer look at my 1934 Big League Gum set, I suspect that Christy Walsh, Lou Gehrig's business manager, convinced Goudey to make several design changes in support of their new Knot Hole League spokesman after their first series. 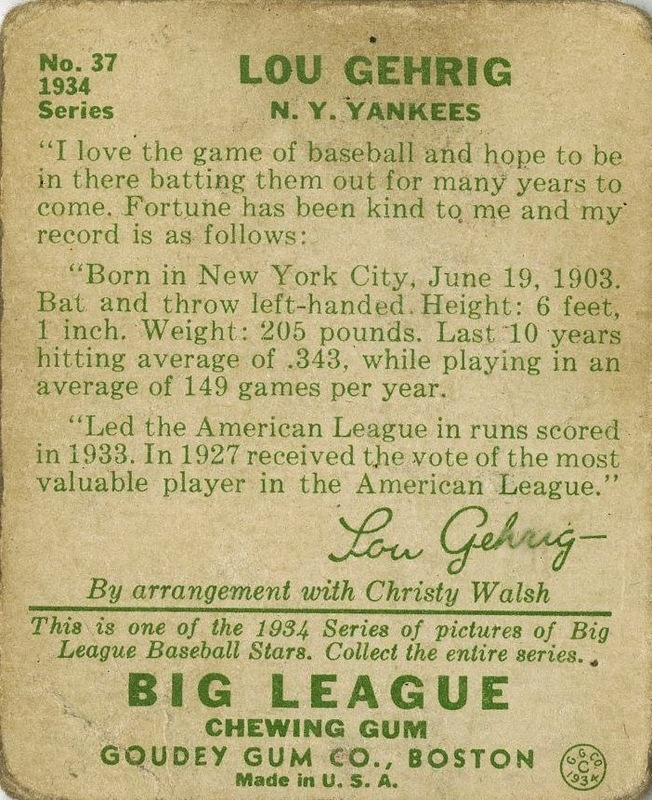 Change 1: Gehrig's signature and "By arrangement with Christy Walsh" appear on every card back for #25-96. 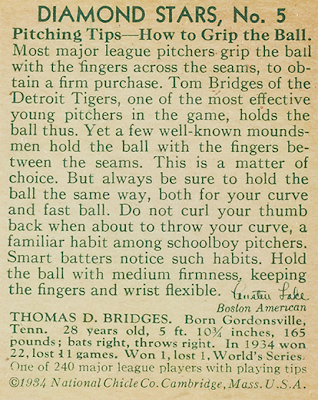 (On #1-24, player stats were quoted without this attribution.) 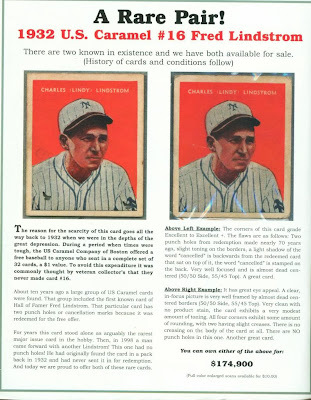 Walsh's byline even appears on the "Chuck Klein says..." cards seen in series four, so he's not exclusive to Gehrig. 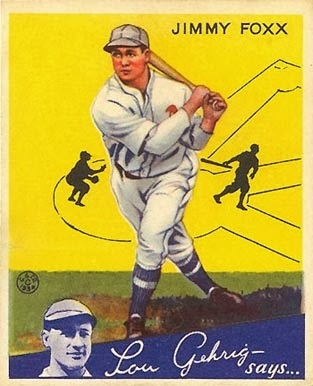 Change 3: In 1933, Goudey saddled Gehrig with the identical cards seen at the start of this post, but not so in 1934, where he picked up new poses on both #37 (series two) and #61 (series three). Change 4: The serious "Lou Gehrig says..." from #1-48 switched to a happier "Lou Gehrig says..." for #49-96. 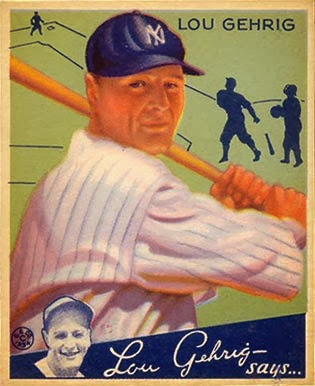 That "happy Gehrig" is simply a reversed version of the #37 portrait, which Goudey also used on other Knot Hole League promos. Note the tiny "by arrangement with Christy Walsh" under Lou's portrait below. I suspect Walsh liked to see his name in print. Change 5: This set is Ruthless. 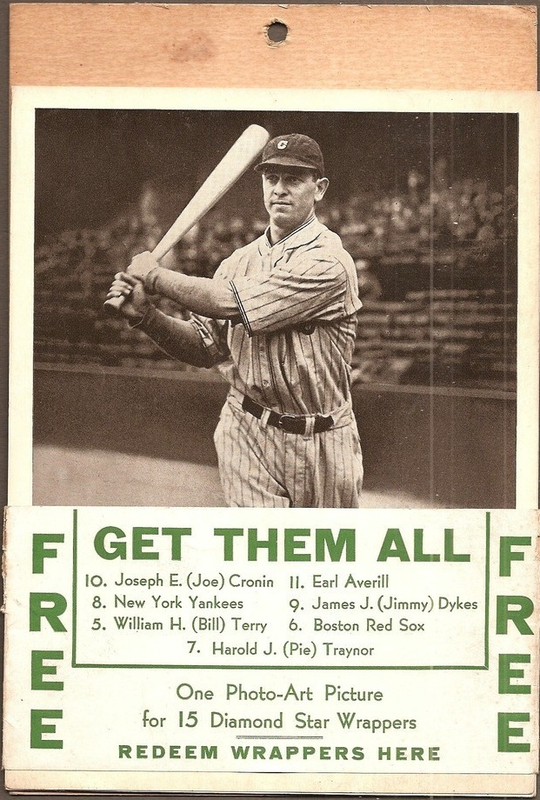 Was the Babe's own asking price too high? 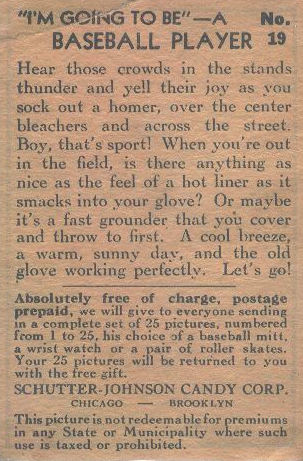 Did Gehrig and Ruth's icy off-field relationship mean no "Lou Gehrig Says..." endorsement for his embittered teammate? 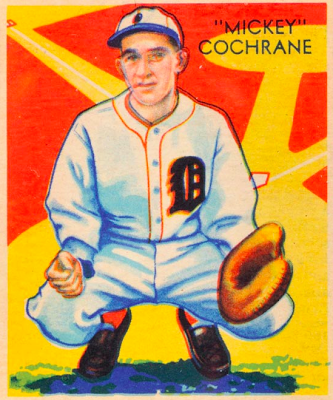 For whatever reason, Goudey left him out of 1934 entirely after devoting four spots to Babe in 1933. 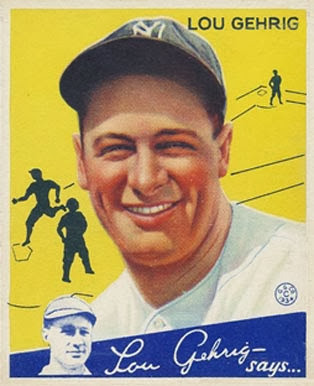 Big League Gum's final series (#73-96) replaced Gehrig's name on National League players with a red banner for Cubs slugger Chuck Klein, while Lou Gehrig's blue banner continued to endorse American Leaguers. 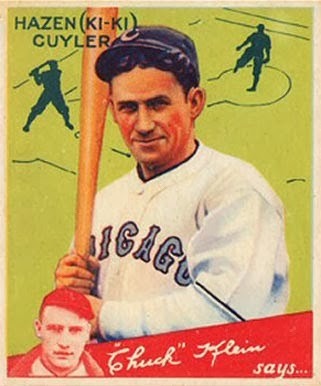 As discussed in the Knot Hole League profile, Klein could've been more marketable to Midwestern fans or kids found it confusing for an American Leaguer like Gehrig to comment on players from the other league. 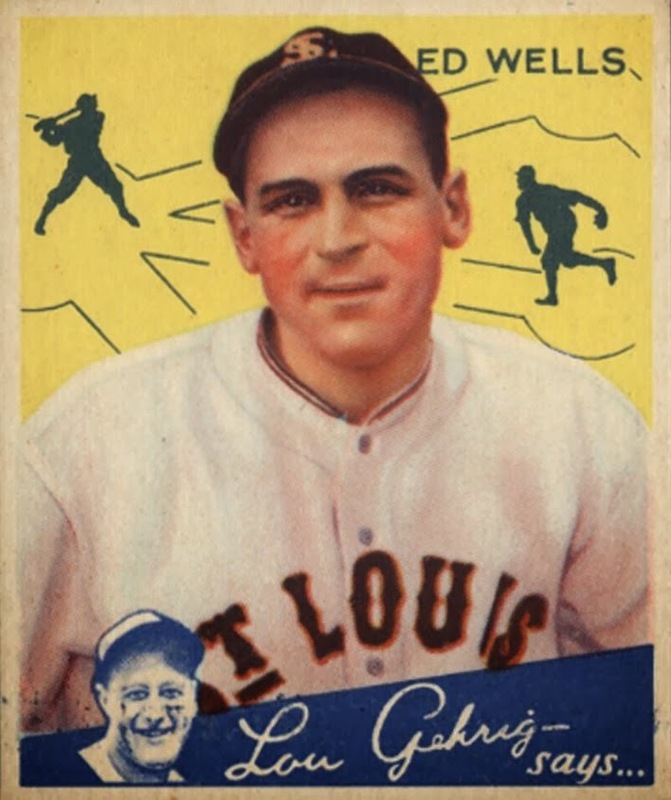 It might've even been Goudey's cost-saving measure to feature Lou on fewer cards, if Chuck's endorsement cost less. 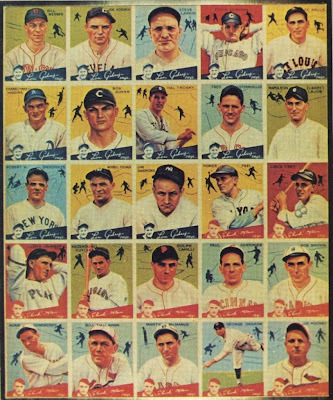 All seven of the 1933-to-1934 repeats received new poses, three with new teams, three after a recent All-Star appearance, and the last being Knot Hole League spokesman Gehrig. But what does it all mean? 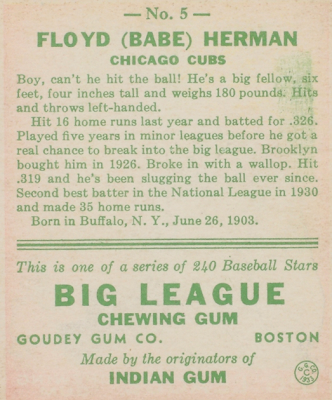 1934 Big League Gum doesn't stand alone the way that 1933 did, nor do I think Goudey intended it to. 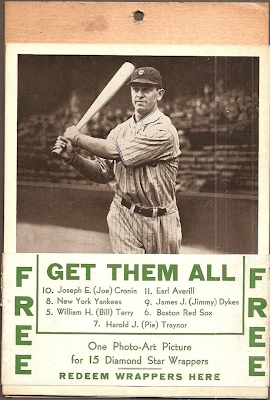 After publishing 240 cards with only minor player reuse in 1933, I'm impressed they found another 60+ players for 1934, even if it lacked star power from today's perspective. 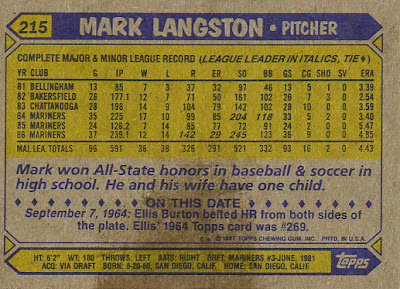 At the time, no trading card "tradition" mandated that baseball sets had to stop one year and start over again the next. Rather, they tried to print what would sell and came up with new plans when customers stopped buying. Above all, companies wanted to make money. Interviews with 1930s collectors recalled Diamond Stars Gum (by Goudey competitor National Chicle) as 1934's hottest release, so Goudey's commitment to including so many newbies and an occasional trade makes 1934 Big League Gum feel like what modern collectors call an "update set" for their 1933 debut. 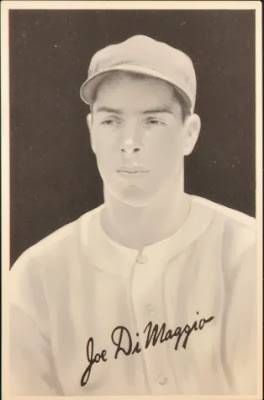 These days, Bowman ("Home of the Rookie Card") might've printed this in the same circumstances, mixing a handful of established stars among dozens of raw prospects. Goudey's 1933-34 omnibus release is close to what we think of as the "modern baseball card," with stats, player demographics, and a comprehensive selection of players and teams. 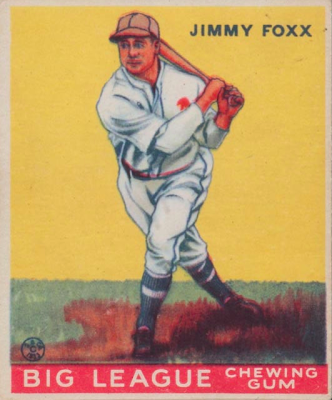 But remember, Goudey found this market untenable just one year later and scaled back new baseball production, effectively ceding the stat-back card market to National Chicle, who was bankrupt by 1937 and barely remembered today beyond their trading cards. 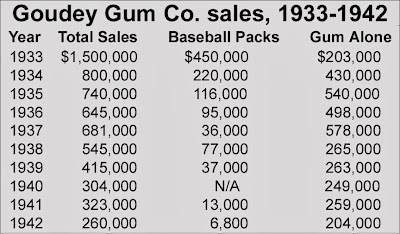 Thanks to an aggressive move to undated sets with a long shelf life, in-store pack redemptions, and revenue from other gum products, Goudey Gum ran lean enough to last beyond WWII and into the 1960s, barely touching new baseball cards in that span. Their Great Depression endurance makes these 1933-34 sets all the more remarkable, where companies took similar designs and goals, but failed to survive more than a year or two. 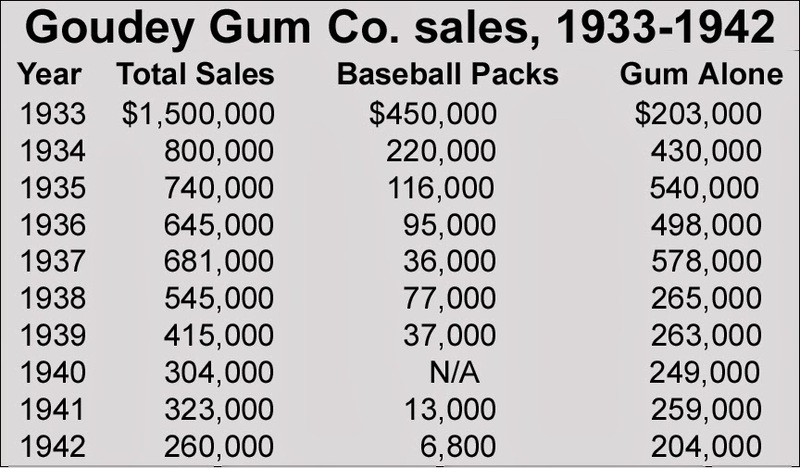 Future posts on the 1930s trading card industry will look more at Boston's gum companies, including Goudey, National Chicle, U.S. Caramel, and DeLong, and how they played off (or stole from) each other during baseball's first era of gum packs.